Twitter is working on several new features for its social networking platform, according to reports shared today by CNBC and BuzzFeed. Twitter is experimenting with algorithmically curated timelines for major news events that will be shown to Twitter users at the top of their main Twitter feeds, a Twitter spokesperson told BuzzFeed this morning. The feature is an extension of "Happening Now," which has previously only highlighted sports-related tweets. 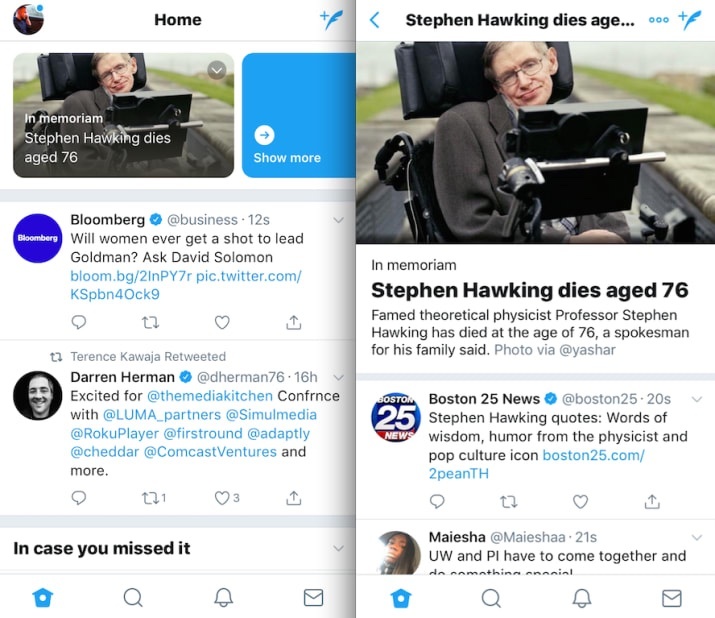 On Wednesday, Twitter began surfacing curated tweets surrounding major news events, including the congressional special election in Pennsylvania and the death of Stephen Hawking. Tweets included those from both news organizations and people who are not news professionals. "People come to Twitter to see and talk about what's happening. We're working on ways to make it easier for everyone to find relevant news and the surrounding conversation so they can stay informed about what matters to them," Twitter product VP Keith Coleman told BuzzFeed News in a statement. Twitter plans to promote curated timelines at the top of the main feed using a banner, and when the banner is tapped, it will bring up Twitter's curated timeline of the event. Currently, a small number of iOS and Android users are able to see the new timeline feature. Separately, CNBC says Twitter is working on a "camera-first" feature that's designed to put more emphasis on video and images. The new functionality combines location-based photos and videos with Twitter Moments around notable events, with companies able to sponsor events or put ads between tweets. CNBC says the feature is similar to aggregated location-based story snaps in Snapchat, which are displayed in the Discover tab. It's not clear when Twitter plans to launch its camera-first feature, and it's still possible that it could be changed drastically or abandoned entirely. Sources who spoke to CNBC believed the feature was in the early stages of development, and Twitter declined to comment.